Track for Nn3 is a somewhat thorny subject. Let me say right up front my personal view is that the track is just as an important part of the model scene as the locomotives and rolling stock, and especially so with narrow gauge railways where the style of the trackwork does so much to set the scene and create the right atmosphere. However, I do recognise that hand-laid track is seen by many people as a "black art" and there is a strong desire to get something running with as little fuss as possible. So let's first look at what is available off the shelf. From people's practical experience, the track gauge of all three seems to vary with Marklin track widest at 6.82-6.83mm on average, Peco in the middle at 6.70-6.72mm on average and Micro Trains is the narrowest at 6.62-6.64mm on average. This might seem a touch academic, but if you want to run 8-coupled locos around a tight radius, it's important information and the size variations will make a difference. 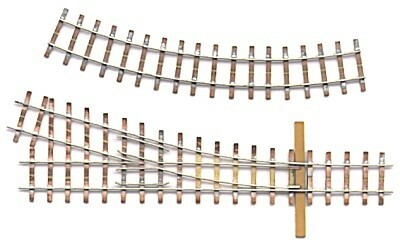 Marklin track is reported to oxidize quickly and requires frequent cleaning. I only have an oval of the stuff from a starter set, so my experience is limited. Turnouts - the only ready to lay turnouts currently available are from Marklin. Undoubtedly, these will be expensive and from accounts on the Nn3 and Z mailing lists, problems can occur with loose blades and gauge variations. Perhaps the biggest problem is visual, there is a large lump of plastic at the side of the turnout which is hard to disguise. There are no indications that Peco ever plan to make any turnouts to match their track. As for Micro-Trains, your guess is as good as mine. So using commercial track, you will basically be laying Z scale track on which to run Nn3 trains. 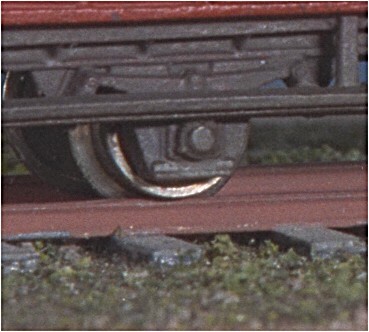 Certainly with the Marklin and Peco track, the sleeper (tie) size and spacing will not be right. Also the code 60 rail section is quite heavy. Careful ballasting and scenic work can disguise a lot of this, like burying the sleepers right in the ground (not recommended at turnouts). The fixed geometry of the turnouts will give an unfortunate rigidity of design which is at odds with the meandering nature of narrow gauge. I've not seen the MTL track but it sounds quite promising, especially if a decent turnout system becomes available. 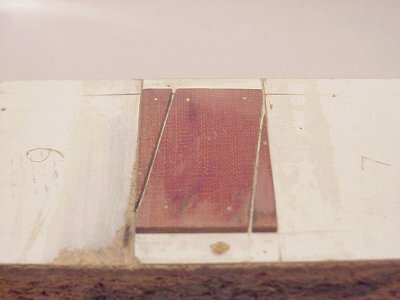 Hand-laid track. If none of this appeals, the next option is to slip down the the crossroads at midnight to sell your soul to the devil in exchange for the knowledge of how to build your own track. In actual fact, it's not as drastic as that. Handlaid track is really quite easy and very satisfying. You become independent of what the trade has to offer and it's a lot cheaper, at least in material cost. There is a good article on building Nn3 turnouts here. If stub turnouts are your thing, then here is a good place to learn about them. What follows is my personal method of building track. When I started in 2mm scale, back in 1982, the only option was to build, still is in fact, so I learnt the hard way, which if truth be told, wasn't all that painful. First - a quick primer on English track. For many years, UK standard gauge track has generally used a system of cast iron chairs to hold a rail section called "bull-head" (number 1 in the diagram). You can see how this compares with flat-bottom rail (number 2). Flat bottom rail is now in use, but there are still many miles of chaired track in existence, notably on the London Underground. On the narrow gauge, chaired track is very rare, only used on the Ffestiniog, in the early years of the Isle Of Man Railway and some French metre gauge lines to the best of my knowledge. There is some 2mm scale standard gauge chaired track in the photos here and here. In N/2mm, we can turn this to our advantage. The 2mm Scale Association offers both bull-head and flat bottom rail in code 40 (0.040" or 1mm high). You can see that the foot of the bull-head rail is smaller than the head, so what I do is use the bull-head rail upside down, (explained why further down) by tinning the former rail top with solder and "sweating" it down onto PCB sleepers (PCB = copper clad Printed Circuit Board), which were initially cut down standard gauge sleepers supplied by the Association, but more recently on correct size NG sleepers made by the Association supplier. The copper surface needs a small gap to electrically separate the rails. Plain track sleepers already have this done while turnout sleepering, which comes in 2" (50mm) strips, can easily have a gap cut on completion using a razor saw to make a tiny cut just to remove the copper. You can see some assembled unpainted PCB track on the right here. I use 100% PCB sleepers because my layouts get frequently taken to exhibitions and club meetings, so are subject to large temperature and humidity changes as they sit in the car overnight on a Friday prior to a weekend exhibition in the hugely variable and unpredictable autumn/winter/spring that makes up a UK modelling season. Also, I happen to prefer soldering, as it's quicker than gluing and you see immediately if you have a decent joint or not. I use a small 15 watt iron with a 1.5mm (1/16") tip, which works fine provided the rail and copper surface of the sleeper is clean. I don't have any experience of using the pre-weathered rail, but I suspect this might need cleaning back to bare metal where soldering is required. The solder used is a thin wire 60/40 solder and I use very dilute phosphoric acid as a soldering flux. Once the track is finished it can be given a quick sluice under a tap (faucet) to rinse off any residual flux, prior to spray painting and laying. Turnouts are made as one unit, while plain track is made as a single rail "fishbone" with the second rail being added once the track is set to the plan. This way you can get nice sweeping curves and smooth transitions. The rail comes in 18" lengths, which I find a convenient size for a length of plain track. 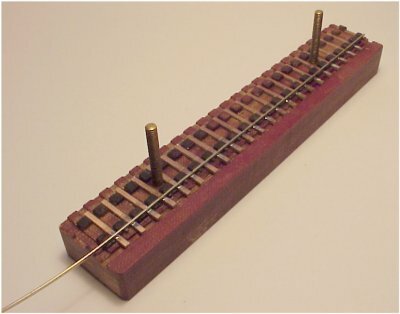 A big aid to soldering is the 2mm Scale Association track jig. The sleeper and rail spacing is for UK standard gauge, but that's no matter as I'm only setting one rail in place and the sleeper spacing is about right for English narrow gauge. Both plain track and the turnouts have a single rail soldered in place using the jig, as this holds the rail upright leaving you to concentrate on getting a neat solder joint. The jig is made from Tufnol, so it's heat resistant to a high degree. One thing you must not do is to heat the copper too much otherwise the bond between it and the PCB backing material will break down. You normally hear a crack and see a puff of smoke if this happens. The track above was made using the jig for the initial stage and after that, I used some modified 2mm track "roller" gauges which have been reset to 6.5mm gauge. For turnouts, 2mm standard gauge templates, photocopied down in size to 6.5mm gauge are a useful aid, but the turnout on the pizza layout was built by eye and a certain amount of guesswork. One you've gained a bit of track building experience, you can resort to such barbaric practices, despite what the "experts" say. 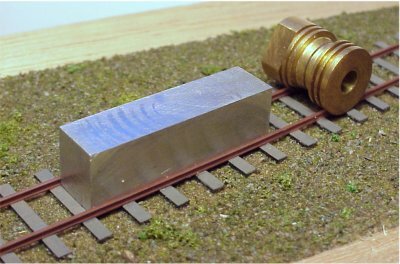 While it's useful to build the turnout over a paper template to aid rail positioning, some gauges will be needed to accurately set the crossing nose. 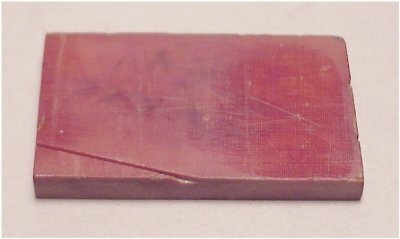 I have two rectangular aluminium blocks which I have filed down to 6.5mm but two ¼" diameter discs could be pressed into service like in the diagram on the below. It's a very good idea to make the section through the crossing (frog) straight, as it's then easy to pick up any errors by sighting through the crossing. Small errors can be corrected by using the soldering iron to gently push the rail into the right place. It's surprising what you can tweak out in this way. Experts will tell you that you should try running stock through the turnout without the check rails. However, don't despair if your turnout fails this test, as the addition of check rails might make all the difference. I use 0.025" for the wing rail gap at the crossing nose and 0.020" for the check rail gap. The slight difference just pulls the wheels away from the crossing nose slightly and helps prevent derailments. There isn't really any definite set sequence for laying the rails of a turnout. I've laid the two stock rails and gauged the crossing from them, and I've also laid one stock rail, the crossing and gauged the second stock rail from there. I would say that the first method is better for curved turnouts and the second better for straight. The reason for using the bull-head rail upside down is that I feel the wide foot of the flat bottom rail adds to the visual "bulk" of the track and you do lose a certain delicacy of appearance. 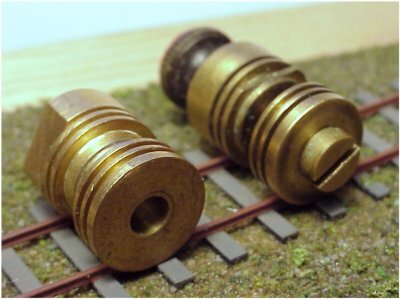 At 0.040" (1mm) high, the rail is still way overscale for narrow gauge, but it appears less so in real life and still leaves ample room for a Z gauge wheel flange as can be seen in the very much enlarged view to the right. Another sneaky advantage in using bullhead rail is that you do not need to make cutouts in the stock rail to accept the point blades, the point blades are easy to file up and so are the crossings. The rail section is effectively only a 1mm by ½mm rectangle so there isn't much filing to do anyway. Any niggly little gaps can easily be filled with solder and filed back to size - shock horror! What would be nice to have available is a proper code 25 or 30 flat bottom rail. This would look absolutely superb and still accept a Z scale flange. Hiromi Masaki in Japan has done some HOn20 modelling using rail of this size made by heating and stretching code 40 rail. No matter what methods are used for track, a decent track bed is required. There seems to be 2 schools of thought on track formation. Some folk like a floating track on a resilient base, as it's quieter and trains seem to run smoother - this is how the real thing operates - while others like a firm rigid base with everything held down tight. Given that N/2mm stock has very little mass to make a resilient system work properly, I tend towards the rigid track base. It's definitely noiser, but the trade off is that you can get the track down and nicely levelled, knowing it will stay put. There is one proviso in that whatever is used for the trackbed must be dimensionally stable. You can get into all sorts of difficulties if it isn't, especially if you've chosen a wood fibre trackbed and then use "wet" scenery techniques. My preference is to use good quality birch plywood of an exterior grade (BS.1088 in the UK) having even laminations. 1/4" (6mm) or 3/8" (9mm) nominal thickness is about right and can be worked with a high degree of precision. 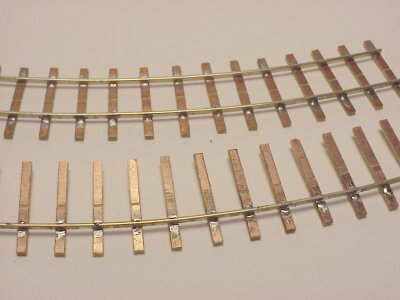 The trackbed should also be sealed using PVA glue (white wood-working glue) or paint if you plan to make extensive use of wet scenery techniques. Other useful types of trackbase are the closed fibre boards such as MDF, hardboard, masonite etc. I wouldn't recommend the very coarse loose fibre insulation boards as a trackbed, these are quite unstable and weak. Other materials such as foamboards have possibilities, but are expensive to buy. I know a UK modeller who has built a 2mm layout using foamboard from recycled advertising features from his place of work in a bank. The whole layout is amazingly light. This photo shows the two basic types of gauges that I use. The block is a simple chunk of aluminium, machined to gauge and a pair of these are used to accurately locate the position of the crossing vee. They are also useful in aligning two adjacent sections of track when tracklaying. Just lie a block across the joint while the glue dries. The brass roller gauge is made from a 2mm component split in half, reduced in width and accurately regauged to 6.5mm. The outer slots are for the running rails, while the inner slots are for the wing rail and check rail. Here is the normal roller gauge, alongside a bright idea I had for an adjustable gauge. This is threaded in the centre, mounted on a fine threaded bolt and a locking nut is used to hold it tight. It works quite well, but is a bit bulky to use compared to the fixed roller gauge. However, it comes in useful for a spot of gauge widening at times. PCB track in the raw. At the top is some completed track, while below is the "fishbone" that comes out of the track jig. This is highly flexible and can be curved to almost any radius, before the second rail is soldered in. The track jig in use. As I only lay one rail in place, it doesn't matter that it is intended for 9.42mm gauge. The sleepers are also thinner than standard gauge versions so sometimes a little irregularity creeps in. Again this is useful as it add to the narrow gauge atmosphere. A filing jig for 1 in 6 and 1 in 7 crossing vees. A piece of rail is put in the slot and a file butted up to the straight edge. The rail is filed until the right angle of "planing" is achieved. This doesn't take long with Code 40 rail. The base is an offcut of kitchen worktop and the top fittings are Tufnol sheet. A filing jig for a 1 in 4 crossing. This time made from a block of Tufnol with a 1mm by ½mm slot cut, logically enough, with a slotting file. These files are very useful, but expensive. I only have one, which is treated with kid gloves. They are used to cut the slots in small screws. If you get one, don't use it on white metal!